The general elections of the United Kingdom are over. There are two main features of the election results. One is that after a long time the incumbent Government increased its parliamentary majority and the other is that the Scottish National Party won 56 seats in Scotland out of a possible 59 seats. The expectation was that there would be a hung parliament b ut the Conservative party, led by David Cameron, was able to muster a majority of more than 50% so that the Prime Minister did not have to depend on the Liberal Democrats as was the case in the last Parliament. It was reported that the leaders of the Labour Party, Liberal Party and UK Independence Party resigned after the announcement of the results. 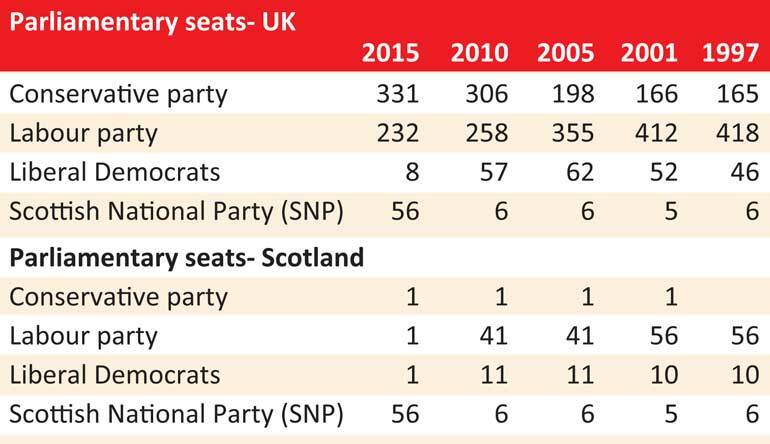 The distribution of parliamentary seats among the major parties in the elections from 1997 to 2015 together with the parliamentary seats obtained by those parties in Scotland is provided in table 1. The Conservative Party campaigned against this slogan, saying that if there was a Labour Government it would be weaker in dealing with the SNP. Not long ago in 2014 there was a referendum in Scotland to decide whether Scotland would be an independent country where the SNP campaigned vigorously under its then-leader Alex Salmond for a ‘yes’ decision. The result was 44.7% yes and 55.3% no. Thereafter Salmond resigned, paving the way for present leader Nicola Sturgeon. In this referendum both conservative and Labour parties campaigned for a ‘No’ outcome. In its 2015 election manifesto the SNP declared the following. “At this election, we have the opportunity to shake up the out of touch Westminster system so that it serves Scotland better. A vote for the SNP on 7 May is a vote for MPs who will always stand up for Scotland’s best interests. It is a vote to make Scotland’s voice heard at Westminster more loudly than it has ever been heard before. And it is a vote for more progressive politics. “The SNP will use its influence at Westminster to help deliver positive change for the benefit of ordinary people, not just in Scotland, but across the UK. We propose a real alternative to the pain of austerity, an end to unfair policies like the Bedroom Tax, a higher minimum wage and protection for our NHS and vital public services. Instead of even deeper Westminster spending cuts, we want to see more investment in our economy, to create more and better paid jobs. And we want the precious resources of our country to be invested in building a better future for our children, not on a new generation of nuclear weapons. The SNP will never put the Tories into power. Instead, if there is an anti-Tory majority after the election, we will offer to work with other parties to keep the Tories out. And we will then use our influence to demand that Labour delivers the real change that people want and need – instead of just being a carbon copy of the Tories. We in Sri Lanka have lessons to learn from British politics and more importantly from the behaviour of the SNP. It is obvious that there are issues for the Scottish people within the Westminster system and that is why there is a movement for separatism. When there is a separatist movement in Scotland the British Government did not want to suppress the same. Firstly they were given more autonomy by a parliamentary act and when the agitation continued a referendum was held in Scotland to determine whether they wanted to move away from the Union. In light of the severe campaign of SNP to move away from the Union, the Prime Minister and the leader of Opposition campaigned at the referendum to influence the Scottish people to stay with the Union, allowing them to have a more balance view. This is democracy in operation at its highest levels. 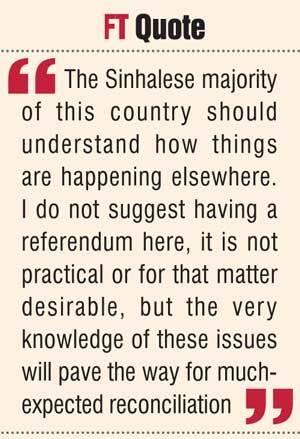 The Sinhalese majority of this country should understand how things are happening elsewhere. I do not suggest having a referendum here, it is not practical or for that matter desirable, but the very knowledge of these issues will pave the way for much-expected reconciliation. On the other hand, the SNP even for a moment was not restricted to Scottish issues. They addressed the issues of the whole country. At one point at the election campaign the SNP leader said: “I also want to make a pledge today to people in England, Wales and Northern Ireland. Even though you can’t vote SNP, your views do matter to me. And you have a right to know what to expect of my party if the votes of the Scottish people give us influence in a hung parliament.” The SNP expressed a clear stand on national policies. In Sri Lanka, minority parties from the beginning focused more on the issues of devolution of power. They hardly focused on national issues. When the TULF was offered the post of the Leader of the Opposition in the Parliament of 1977, Amirthalingam hardly used that opportunity to protest against the authoritarian rule that was emerging. They did not want to merge with the national politics and their approach towards it was a restricted one. Hence average Sinhala people were of the view that Tamil parties were demanding a separate state. Had they involved themselves in the general political struggle of the south fighting for a better Sri Lanka for all of us, as done by the SNP in UK, the perception of the average Sinhalese of Tamil parties would have been more positive. This attitude, if they had it, would have contributed to a certain extent to avoid the disastrous war we have experienced. Although the TNA is involved more in southern politics nowadays there is lot more to be done in comparison to the activities of the SNP. Finally three party leaders resigned after the results, taking responsibility for the defeat. Those who have criticised Ranil Wickremesinghe for hanging on too long, fight to bring back the defeated Rajapaksa. In the light of the election results and possible Scottish separatism threats, David Cameron has promised to lead a Government for “one nation” and make “Great Britain greater.” Sri Lanka also should have “one nation” even at this late hour and then we can make Sri Lanka greater.